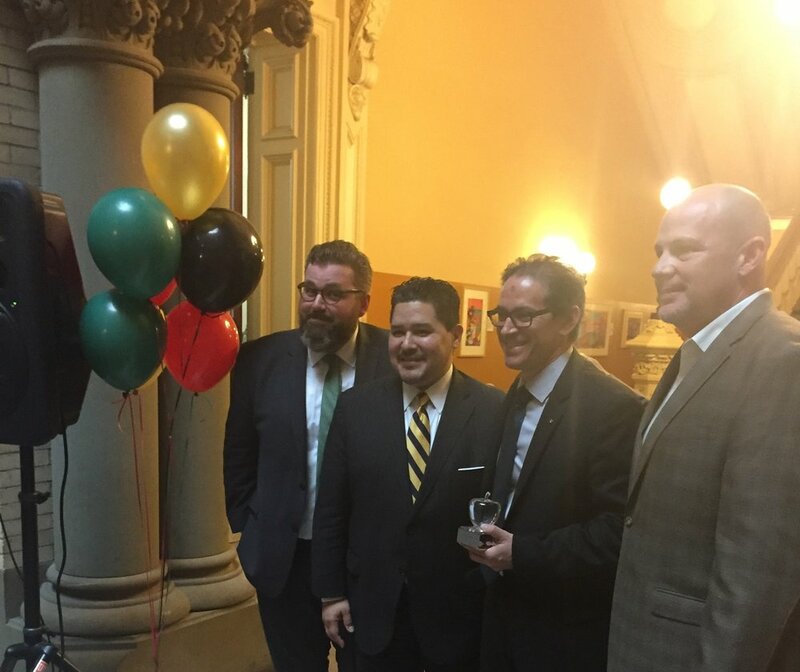 On June 14, 2018, the 17 educators who were selected as winners of the 2018 Big Apple Awards were honored at Tweed Courthouse. The Big Apple Awards are a city-wide recognition program celebrating the dedication, rigor, and community spirit of New York City public school teachers. Now in its sixth year, the recognition program continues to grow and engage more school communities each year. Nearly 13,500 unique DOE teachers have been nominated by members of their school communities since the program was founded in 2013. This year, out of over 6,500 nominations, Big Apple Awards were given to 17 classroom teachers, along with one music educator and a physical education teacher. Chancellor Carranza and Deputy Chancellors surprised the winning teachers in their classrooms to deliver the exciting news of their award. These joyful visits brought students and school staff together to recognize their teachers, and the tireless work they do supporting New York City public school students — both in and out of the classroom. The Fund for Public Schools supports the Big Apple Awards through partnerships and donations made by two NYC nonprofits that are dedicated to making an impact in the lives of students — Lincoln Center Education and New York Road Runners. For the second consecutive year, Lincoln Center Education and New York Road Runners have each sponsored a Big Apple Award. Lincoln Center Education is an organization that works to enrich the lives of children by providing opportunities to engage with the arts on stage, in educational settings, online, and in the community. The Acting Executive Director, Alex Sarian, presented the Big Apple Arts Education award to Alberto Toro, the instrumental music teacher at I.S. 007 Elias Bernstein in Staten Island. Toro’s students enter his classroom with a limited knowledge of music, but within a few months, their level of listening, discipline, and performance ability increases dramatically. For the past three years, the school band was selected to perform in the Staten Island Borough Arts Festival. They have also performed and assisted at events for Cancer Survivors and Lifestyles for the Disabled. The jazz ensemble has received seven consecutive gold medal awards at the annual NYSSMA Adjudication Festival in NYC. Alberto Toro Accepts the Big Apple Arts Education Award. Photo courtesy DOE. The New York Road Runners sponsors the Big Apple Physical Education Award. New York Road Runners also provides fitness and wellness programs to over 800 schools across New York City. Cliff Sperber, Director of Outreach at New York Road Runners, presented the Physical Education award to Mike Rosario, who teaches 7th and 8th grade PE at P.S. 279 Captain Manuel Rivera, Jr. in the Bronx. Rosario has dedicated twenty years of his career to teaching at PS 279 and instills a love of movement in his students that he hopes they carry with them throughout their lives. Students are motivated to exercise and be fit under Mike’s direction, with ofer 60% of his students participating in his fitness and athletic programs that take place before and after school. Many of his students also continue to play sports in high school, and then attend college. Mike Rosario accepts the Big Apple Physical Education Award. Photo Courtesy DOE. The 17 award winners will serve as Big Apple Fellows in the 2018-19 school year. As fellows, they hold monthly meetings with one another, working to build leadership skills and to be ambassadors for their profession. Award recipients are invited to serve on the Chancellor’s Teacher Advisory Group, and are provided grants to support their classrooms and practice. Through bi-monthly meetings, this group advocates for teachers city-wide and contributes to DOE policy. of nominations came from our students and families. schools had at least one teacher nomination (2/3 schools in NYC!) with representation from every borough and district. applicants were named finalists, engaging with superintendent teams through a classroom visit and/or interview.